The current study investigated hepatoprotective and antioxidant effects of Aegle marmelos leaves extract. The major constituent present in the extract i.e. rutin was quantified by using HPLC. Further, the study explored hepatoprotective effect of A. marmelos (70% ethanol extract) in combination with piperine. The normal control and carbon tetrachloride (CCl4) administered rats were divided into 7 groups. Hepatic damage biomarkers were determined in serum samples and oxidative stress biomarkers (malondialdehyde, reduced glutathione, glutathione reductase, glutathione peroxidase, glutathione-S-transferase, superoxide dismutase and catalase), pro-inflammatory and anti-inflammatory cytokines were determined in liver homogenates. CCl4 caused marked liver damage as evident by significant increased activities of serum alkaline phosphatase, bilirubin, lactate dehydrogenase, alanine aminotransferase, aspartate aminotransferase, Interleukin 10 and Tumor necrosis factor-α levels compared to normal control. The oxidative stress parameters also significantly modulated in CCl4 group as compared to normal control. Treatment with A. marmelos reduced the severity of toxicity in a dose dependent fashion and the results of A. marmelos extract 50 mg/kg group were comparable to silymarin group. The low dose of A. marmelos extract (25 mg/kg) per se did not significantly reversed the hepatotoxicity but low dose of A. marmelos in combination with piperine showed significant reversal of hepatotoxicity. In conclusion, A. marmelos exerts potential hepatoprotective activity through its antioxidant and anti-inflammatory properties which was enhanced by co-treatment with piperine. Aegle marmelos, commonly known as Bael, a spiny tree of Rutaceae family is an indigenous tree found in India, Myanmar, Pakistan and Bangladesh. The leaves, roots, bark, seeds and fruits are edible and have medicinal values. The root is an important ingredient of the ‘Dasmula’ (ten roots) recipe . Ayurveda describes the medicinal properties of this plant. Ayurvedic literature claims various pharmacological properties of Bael leaves. Activities include astringent, laxative, and expectorant, useful in treatment of ophthalmia, deafness, inflammations, cataract, diabetes, diarrhoea, dysentery, heart palpitation, and asthmatic complications . Increased use of A. marmelos as a medicinal agent in different systems of medicine including folk medicine, various research studies undertaken in recent past to explore the therapeutic potential of different parts of the plant. A number of studies showed antifungal , ulcer healing , anti-inflammatory  and anti-diabetic  properties of A. marmelos. Literature also reports diuretic , anti-fertility , hepatoprotective activities  and anticancer properties . Economics of treatment, linked to drug dosage, has led to new drug development strategies. Piperine is an amide alkaloid found in the fruits of black and long pepper plants (Piper nigrum Linn and Piper longum Linn). Black pepper has several uses in Ayurvedic medicine, the effects of which are attributed to piperine. Piperine is reported to have many pharmacological activities such as analgesic and anti-inflammatory  and usefulness in various gastrointestinal disorders . Hepatoprotective activity of piperine has also been reported . CCl4 is a widely known experimental hepatotoxin. It accumulates in hepatic parenchymal cells and metabolically activated by cytochrome P-450 dependent monoxygenases forming a trichloromethyl free radical (CCl3). This free radical alkylates cellular proteins and other macromolecules with a simultaneous attack on polyunsaturated fatty acids in the presence of oxygen to produce lipid peroxides. This causes alterations in the Ca++ homeostasis resulting in cell death . The effects of CCl4 on hepatocytes are manifested histologically as hepatic steatosis (e.g. fatty infiltration), centrilobular necrosis and cirrhosis depending upon dose and exposure time. Hepatic steatosis of the liver is a multifactorial phenomenon and is thought to occur due to blockage of lipoprotein secretion , impaired synthesis or peroxidation of phospholipids, or both . 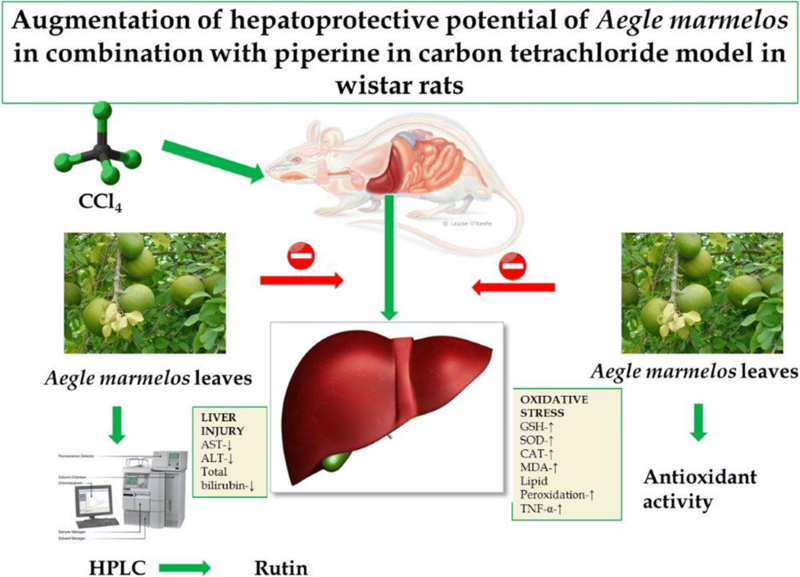 Considering the diverse medicinal properties of A. marmelos, the present study explored protective effects of A. marmelos leaves and the effect of co-administration of piperine against CCl4 induced hepatotoxicity in rats. All the chemicals were purchased from Thermo Fisher Scientific. High performance liquid chromatography (HPLC) was performed on Agilent technologies HPLC system with column from Agilent eclipse XBD®; Serum biomarkers were used as Accurex kits (Accurex Biomedical Pvt. Ltd, India); Graph Pad Prism (Version 5) from San Diego, CA, USA; Piperine and Silymarin from Sigma-Aldrich, USA. Collection of A. marmelos leaves was undertaken from areas in and around Chandigarh, India during the month of January. Dr. Sujata Bhattacharya, Assistant Professor, School of Biological and Environmental Sciences, Shoolini University, Solan authenticated the plant material. Voucher specimens of the plant (SUBMS/89) were deposited in the School of Biological and Environmental Sciences, Shoolini University, Solan. The dried coarsely powdered leaves of the plant (500 g) were first extracted with the petroleum ether followed by 70% ethanol by the hot extraction process using a Soxhlet apparatus [17, 18]. The solvent removed by distillation under reduced pressure after completion of extraction process and the prepared extract was stored in vacuum desiccator until further use. The extract was tested for the presence of bioactive compounds by using the standard methods explained by previously [17, 18]. Preliminary phytochemical screening was carried out to confirm the presence of alkaloids, carbohydrates, flavonoids, fixed oils and fats, tannins and phenolic compounds, phytosterols, protein/amino acids and saponins by using standard procedures described by Harborne  and Kokate . 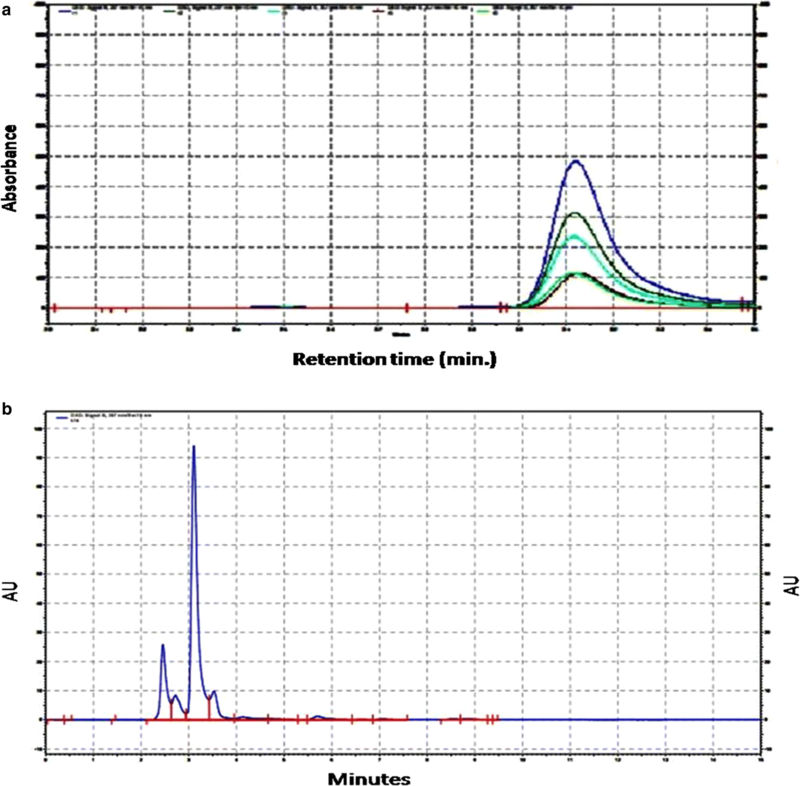 The rutin content of the extract was determined chromatographically using HPLC system [19, 20] of Agilent technologies, with column from Agilent eclipse XBD® C 18 bonded with 5 µm (4.6 × 150 mm). Before starting validation, system suitability parameter was calculated. It was determined by taking percent relative standard deviation (RSD) of the five standards injections using the same concentration of rutin by HPLC method. The precision of system was checked as per the developed method by using multiple injections of a homogeneous standard solution. This indicated the performance of the HPLC instrument under the chromatographic condition. As a part of method validation minimum five injections of the standard preparation were performed for inter day precision. The relative standard deviation was not more than 2.0%. Limits of detection (LOD) and Limit of quantification (LOQ) were calculated by method based on standard deviation (σ) and slope (S) of calibration plot using formula LOD = 3.3 σ/S and LOQ = 10 σ/S. The DPPH or 2,2-diphenyl-1-picrylhydrazyl assay was performed using the method of Molyneux . Then the absorbance recorded at 515 nm. The standard curve was linear between 25 and 800 mM Trolox. Results are expressed in mMTE/g fresh mass. ABTS or 2,2′-azino-bis(3-ethylbenzothiazoline-6-sulphonic acid) assay was also used to evaluate antioxidant potential of the extract . Results are expressed by comparison with standard amounts of the synthetic antioxidant trolox (a water-soluble vitamin E analogue) to give rise to the Trolox equivalent antioxidant capacity (TEAC). The total antioxidant activity of A. marmelos was evaluated by Ferric reducing ability of plasma (FRAP) method . The results were expressed as ascorbic acid equivalent antioxidant capacity (AEAC). Normal control; animals of this group were fed pellets and water ad libitum for 15 days. Drug control; rats were administered 50 mg/kg body weight leaf extract of A. marmelos for 15 days. CCl4 group; rats were administered only 3 ml/kg CCl4. Positive control; rats were administered CCl4 + 200 mg/kg silymarin. A. marmelos extract 25 group; rats were administered CCl4 + A. marmelos extract 25 mg/kg. A. marmelos extract 50 group; rats were administered CCl4 + A. marmelos extract 50 mg/kg. Piperine group; rats were administered CCl4 + A. marmelos extract 25 mg/kg + piperine 20 mg/kg. All the drugs were administered orally for 15 days; CCl4 was administered once on the fifth day of the treatment period in a dose of 3 ml/kg body weight intraperitoneal (i.p.) . The dose of A. marmelos used in the present study was based upon the lethal dose (LD50) values . The doses of silymarin 200 mg/kg  and piperine at 20 mg/kg  were selected from literature reports. The animals were fasted overnight before sacrificing. On the day of sacrifice rats received their respective drugs and 2 h later were injected with thiopentone (50 mg/kg i.p. ), and blood was withdrawn by cardiac puncture. The blood was centrifuged at 4000g for 15 min at 4 °C and serum separated. The liver was removed and washed in ice-cold saline solution. A part of it homogenized in phosphate buffer saline (0.1 M PBS, pH 7.4). The homogenates centrifuged at 4000g for 20 min at 4 οC and supernatant was stored at − 80 °C. Hepatic damage serum biomarkers, alkaline phosphatase (ALP), bilirubin, lactate dehydrogenase (LDH), alanine aminotransferase (ALT) and aspartate aminotransferase (AST) were measured by an auto-analyzer using the Accurex kits (Accurex Biomedical Pvt. Ltd, India). The total protein was estimated by Lowry  method. Evaluation of oxidative stress parameters was done in liver homogenates. Malondialdehyde (MDA) level in the liver was determined according to the method of Ohkawa . Results are expressed as nM MDA/mg of protein. Reduced glutathione level was estimated by the method of Ellman . The results are expressed as μg/mg of protein. Superoxide dismutase (SOD) activity was estimated according to method of Robak . The results are expressed as U/mg of protein. Catalase (CAT) activity was measured by the method of Aebi . The results are expressed as µM of hydrogen peroxide decomposed/mg of protein. Glutathione reductase (GR) activity was measured by the method of Carlberg . The rate of Nicotinamide adenine dinucleotide phosphate (NADPH) oxidation is directly proportional to the GR activity in the sample. GR activity is expressed as nM of NADPH oxidized/min/mg of protein. GSH-S-transferase (GST) activity was measured spectrophotometrically by the method of Habig . GST enzyme activity was calculated as nM of CDNB–GSH conjugate formed/min/mg of protein. Glutathione peroxidase (GPx) activity was calculated as described by Athar . The activity was recorded at 340 nm and expressed as nM of NADPH oxidized/min/mg of protein. Glucose-6-phosphate dehydrogenase (G6PD) activity was determined by the method of Zaheer . The changes in absorbance were recorded at 340 nm and enzyme activity was calculated as nM of NADPH formed/min/mg of protein. The total protein was estimated by Lowry method . IL-10 and TNF-α level in serum were estimated by Enzyme-Linked Immunosorbent Assay (ELISA) method. The concentration of the cytokines in 100 µl sample volume was determined according to the manufacturer’s protocol. IL-10 and TNF-α concentrations are expressed as pg/ml. Liver of rats from different groups was fixed in 10% neutral buffered formalin. After fixation, liver samples were dehydrated in alcohol, cleared in xylene, and embedded in paraffin wax 56 °C in hot air oven for 24 h. Paraffin embedded tissue blocks were prepared for sectioning at 5 mm thickness by a micro-tome. The obtained tissue sections were collected on glass slides, deparaffinized, and stained by hematoxylin and eosin (H&E) stain for histopathological examination through the light microscope. Results expressed as mean ± SEM (standard error mean). The statistical analysis was done using program Graph Pad Prism 5.0 Version for Windows (San Diego, CA, USA). The data were analyzed statistically by using one way analysis of variance (ANOVA). In case ANOVA showed significant difference, post hoc analysis performed with Tukey’s test. p < 0.05 was considered to be statistically significant. The collected leaves were authenticated and the hydro-alcoholic extract was prepared and stored in desiccator for further use. The percentage yield obtained was 18.2% w/w. Results of the preliminary phytochemical screening of leaves extract showed the occurrence of alkaloids, carbohydrates, flavonoids, tannins, phenolic compounds and phytosterols (Table 1). Literature reports that the hydro-alcoholic leaf extract of A. marmelos has maximum amount of flavonoid and phenolic compounds, rutin being the major component [37, 38]. The presence of the polyphenolic compound rutin was further confirmed by HPLC studies. Validation and optimization of chromatographic conditions for reverse phase HPLC (RP-HPLC) method for estimation of rutin was performed (Table 2). The mobile phase combination of methanol, acetonitrile and water in the ratio of 40:15:45 containing 1.0% acetic acid v/v, injection volume 10 µl and flow rate of 1 ml/min using UV detector at 257 nm was used. An overlay chromatogram was prepared at 257 nm with different concentrations (Fig. 1a). A calibration curve of rutin was prepared using different concentrations (100, 200, 300, 400 and 500 µg/ml) of pure rutin. Typical chromatogram with optimized condition gave sharp and symmetric peak with specific retention time of 3.107 ± 0.0145 min (Fig. 1b). The percent relative intraday standard deviation (%RSD) values were 0.342–0.786 μg/ml and those for inter day precision were 0.411–0.547 μg/ml respectively. The derived LOD and LOQ for rutin were determined to be 0.6 and 1.7 μg/ml, respectively. The three assays demonstrated the potential antioxidant ability of leaf extract of A. marmelos (Table 3). The extract exhibited concentration dependent ability to quench DPPH free radical. In this assay, 85.3 ± 2.2% inhibition was achieved at concentration 640 μg/ml. The IC50 of extract was 160.9 μg/ml and that of Trolox was 9.2 μg/ml. The extract also showed significant ABTS scavenging potential, 640 μg/ml contraction showed 90% inhibition. The IC50 of extract in ABTS assay was 134.54.2 μg/ml and for Trolox it was 4.2 μg/ml. Further to this, the extract also showed an ability to donate electrons to convert Fe3+→Fe2+ as indicated by the concentration dependent increase in the percentage reducing power. However, the maximum inhibition (at 640 μg/ml) observed significantly lower compared to DPPH and ABTS assay. The IC50 in FRAP assay was observed at 424.5 μg/ml which is significantly higher than the other two assay. CCl4 administration resulted in significant liver damage as revealed by the elevated level of serum hepatic enzymes (AST, ALT, ALP and LDH) and reduced level of protein and increased level of total bilirubin. CCl4 treated group showed significant increase in AST (p < 0.001) and ALT (p < 0.001) levels as compared to normal control group. Treatment with A. marmelos (50 mg/kg) significantly (p < 0.001) reduced AST and ALT levels as compared to CCl4 group. 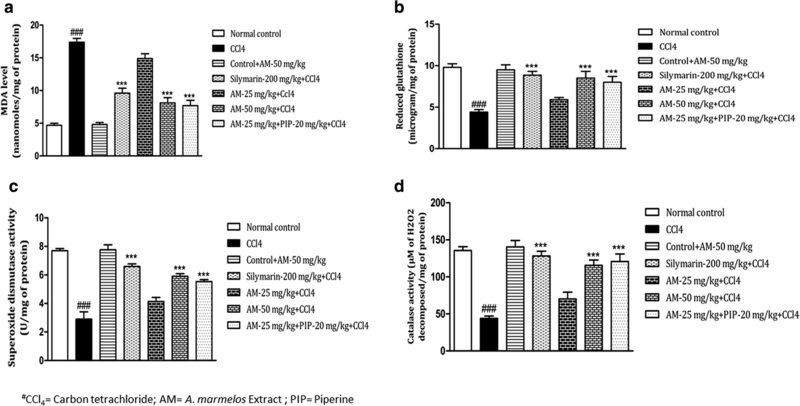 Moreover, co-administration of A. marmelos 25 mg/kg and piperine significantly (p < 0.001) lowered the AST and ALT level as compared to CCl4 group (Fig. 2a, b). Whereas, A. marmelos 25 mg/kg failed to lower the elevated levels significantly. The results of A. marmelos extract 50 group and A. marmelos extract 25 + Piperine group were comparable to that of silymarin group. When compared with normal control group, ALP and LDH levels were found to be significant (p < 0.001) higher in CCl4 treated group. A. marmelos 50 mg/kg and A. marmelos 25 mg/kg + piperine treatments significantly ameliorated the elevated ALP level (p < 0.001 and p < 0.01 respectively) as compared to CCl4 treated group (Fig. 2c). The A. marmelos extract 25 mg/kg treatment lowered the elevated levels but not significantly as compared to CCl4 group. LDH level was significantly lowered by the treatment with A. marmelos 25 mg/kg (p < 0.01), A. marmelos 50 mg/kg (p < 0.001) and A. marmelos 25 mg/kg + piperine (p < 0.001) (Fig. 2d). The ALP and LDH levels in A. marmelos 50 mg/kg group and A. marmelos 25 mg/kg + piperine groups were comparable to silymarin group with no significant difference. Furthermore, administration of CCl4 significantly reduced the total protein level (p < 0.001) and increased the total bilirubin level (p < 0.001) as compared to normal control group. Total bilirubin level was dose dependently reduced with A. marmelos treatment (Fig. 2e). A. marmelos 25 mg/kg (p < 0.01), A. marmelos 50 mg/kg (p < 0.001). Total bilirubin level in A. marmelos extract 25 mg/kg + piperine group was significantly lower as compared to A. marmelos extract 25 mg/kg group. Total protein was significantly increased with A. marmelos extract 50 mg/kg (p < 0.001) treatment and A. marmelos 25 mg/kg + piperine (p < 0.001) as compared to CCl4 group (Fig. 2f). The total protein and bilirubin levels in A. marmelos 50 mg/kg and A. marmelos extract 25 mg/kg + piperine group were comparable to silymarin group. The results of drug control group were comparable to normal control group. Administration of CCl4 caused marked oxidative stress as indicated by significant increase in MDA level (p < 0.001) and decrease in reduced glutathione level (P < 0.001), as compared to normal control group. MDA level was significantly reduced in A. marmelos extract 50 mg/kg (P < 0.001) and A. marmelos extract 25 mg/kg + piperine (p < 0.001) treatment groups as compared to CCl4 group (Fig. 3a). A. marmelos extract 25 mg/kg group decreased MDA levels but the results were not significant as compared to CCl4 group. The CCl4 induced reduction in the reduced glutathione level was alleviated by the treatment with A. marmelos extract 50 mg/kg (p < 0.001) and A. marmelos extract 25 mg/kg + piperine treatment (p < 0.001) (Fig. 3b) as compared to CCl4 group. A. marmelos extract 25 mg/kg group increased reduced glutathione level but the results were not significant as compared to CCl4 group. Treatment with silymarin-200 mg/kg significantly ameliorated the CCl4 induced alterations in MDA (p < 0.001) and reduced glutathione (p < 0.001) levels. The results of silymarin group were comparable to A. marmelos extract 50 mg/kg group and A. marmelos extract 25 mg/kg + piperine group. The endogenous antioxidant enzymes i.e. SOD and catalase activities were significantly lowered by the administration of CCl4. Alterations in the SOD activity was significantly reversed by treatment with A. marmelos extract 50 mg/kg (p < 0.001) and A. marmelos extract 25 mg/kg + piperine (p < 0.001) (Fig. 3c). Similarly, catalase activity was significantly increased with v-50 mg/kg (p < 0.001) treatment and A. marmelos extract 25 mg/kg + piperine (p < 0.001) treatment as compared to CCl4 group (Fig. 3d). The SOD and catalase activity improved with A. marmelos extract 25 mg/kg treatment but the difference was not significant as compared to CCl4 group. Silymarin treatment significantly (p < 0.001) ameliorated the CCl4 induced alterations in SOD and catalase enzymes activity. The SOD and catalase activity of A. marmelos extract 50 mg/kg group and A. marmelos extract 25 mg/kg + piperine group were comparable to silymarin group. The results of drug control group were comparable to normal control group. The CCl4 administration caused a significant (p < 0.001) reduction in glutathione reductase, transferase and peroxidase and G6PD activities as compared with the normal control group. These alterations reversed significantly by treatment with A. marmelos extract 50 mg/kg. CCl4 induced reduction in glutathione reductase activity was significantly reversed by the treatment with A. marmelos extract 50 mg/kg (p < 0.001) and A. marmelos extract 25 mg/kg + piperine treatment (p < 0.001) (Fig. 4a). Glutathione transferase activity was significantly increased by A. marmelos 25 mg/kg (p < 0.05), A. marmelos 50 mg/kg (p < 0.001) and A. marmelos extract 25 mg/kg + piperine (p < 0.001) treatment as compared to CCl4 treated animals (Fig. 4b). Figure 4c depicts the elevation of glutathione peroxidase activity with A. marmelos extract 50 mg/kg (p < 0.001) treatment and by treatment with A. marmelos extract 25 mg/kg + piperine (p < 0.01) as compared to CCl4 group. G6PD activity was also increased by the treatment with A. marmelos 25 mg/kg (p < 0.05), A. marmelos 50 mg/kg (p < 0.001) and A. marmelos Eextract 25 mg/kg + piperine treatment (p < 0.001) as compared to CCl4 group (Fig. 4d). Silymarin 200 mg/kg significantly ameliorated CCl4 induced alterations in glutathione reductase (p < 0.01), transferase (p < 0.001) and peroxidase (p < 0.001) and G6PD (p < 0.001) activities. The results of A. marmelos extract 50 mg/kg group and A. marmelos extract 25 mg/kg + piperine group were comparable to silymarin group. The results of drug control group were comparable to normal control group. Pro-inflammatory cytokine (TNF-α) was significantly increased (p < 0.001) in the serum of CCl4 administered rats as compared to normal control group. However, treatment with A. marmelos 25 mg/kg (p < 0.01), A. marmelos (50 mg/kg (p < 0.001) and A. marmelos 25 mg/kg + piperine (p < 0.001) significantly prevented the elevation of serum TNF-α level (Fig. 5a). IL-10 was found to be significantly higher in CCl4 administered group as compared to normal control group. Treatment with A. marmelos 25 mg/kg, A. marmelos 50 mg/kg and A. marmelos extract -25 mg/kg + piperine 20 mg/kg did not produce any significant effect on serum IL-10 level as compared to CCl4 group (Fig. 5b). Silymarin 200 mg/kg did not show any significant effect on serum IL-10 level but it significantly reduced CCl4 induced elevated serum TNF-α level. The results of drug control group were comparable to normal control group. Histological analysis revealed that CCl4 caused marked hepatotoxicity as evident by shrinkage of central veins, hepatocellular hypertrophy and necrosis. Figure 6 shows normal architecture of hepatocytes and liver parenchyma, distinct hepatic cords and central vein in normal control group. Treatment with A. marmelos (50 mg/kg) and the combination with piperine reduced severity of hepatic damage as compared to CCl4 group. Moreover, vascular distortion and lymphocyte infiltration were also reduced in extract-50 and piperine group, which further confirms its hepatoprotective effect. The published literature provides evidence that various parts of A. marmelos showed hepatoprotective potential. However, most of the available reports are of fruits. Moreover, either the reported dose of A. marmelos leaves extract was very high  or was not so effective at low doses for the desired hepatoprotection . Additionally, the reported literature showed no evidence of relationship between the dose selections of the drug extract based on the reported LD50 values. The current study has covered both these gaps in the literature by demonstrating the hepatoprotective potential of standardized A. marmelos leaves extract in a dose dependent manner utilizing the LD50 data reported and providing evidence that the addition of piperine to the leaves extract of A. marmelos aids in achieving the desired hepato-protection at lower doses. Hepatocytes are the main component that regulates various metabolic activities of liver. Distortion of this organ will result in disorder of body metabolism [40, 41]. An accidental over dosage administration of CCl4 can result in hepatic damage. The development of CCl4-induced hepatotoxicity seems to depend partly on the existence of free radicals and oxidative processes [42, 43]. For that reason, it is hypothesized that extracts/compounds possessing free radical scavenging and/or antioxidant activities could also demonstrate hepatoprotective activity against the CCl4 toxic effect. This is supported by claim that the combination of hepatoprotective effect and antioxidant activity synergistically prevents the process of initiation and progress of hepatocellular damage . In the present study the phytochemical standardization and antioxidant potential of A. marmelos leaves extract was carried out followed by the evaluation of hepatoprotective potential and the augmentation of the hepatoprotective activity by co-administration of piperine. Our results demonstrated A. marmelos extract has the ability to scavenge free radicals and to exert antioxidant activity, using the DPPH assay, which is in agreement with literature . A. marmelos leaves extract exhibited concentration dependent antioxidant potential. The IC50 of the extract was observed at 160.9 μg/ml in DPPH assay and 134.5 μg/ml in ABTS assay. The IC50 in FRAP assay was observed at 424.5 μg/ml which is significantly higher than the other two assay. Literature reports that many phenolic compounds having overlapping spectra may react with DPPH and ABTS which interfere with the final results . Moreover, the inflammatory processes activated by CCl4 are intimately involved in the chemical-induced hepatotoxic processes . The inflammatory processes are thought to be responsible for producing various mediators, which are involved in the production of reactive oxygen species (ROS) and nitric oxide (NO) that can affect liver damage or repair. Therefore, it is also possible to postulate that extracts/compounds possessing anti-inflammatory activity might also exhibit hepatoprotective activity. The results of the preliminary phytochemical screening of A. marmelos demonstrated the presence of high content of phenolic compounds in accordance with the literature reports. Furthermore, estimation of rutin in A. marmelos extract was performed by using HPLC. The results revealed the presence of rutin in good amounts in the hydro-alcoholic extract of A. marmelos leaves. Literature reports that rutin has potent hepatoprotective and anti-oxidant effects and can be used as an alternative treatment for liver diseases [48, 49]. Taking all these reports into consideration; it is plausible to suggest that the hepatoprotective activity of A. marmelos, was partly correlated to the synergistic effect of phenolic compounds. 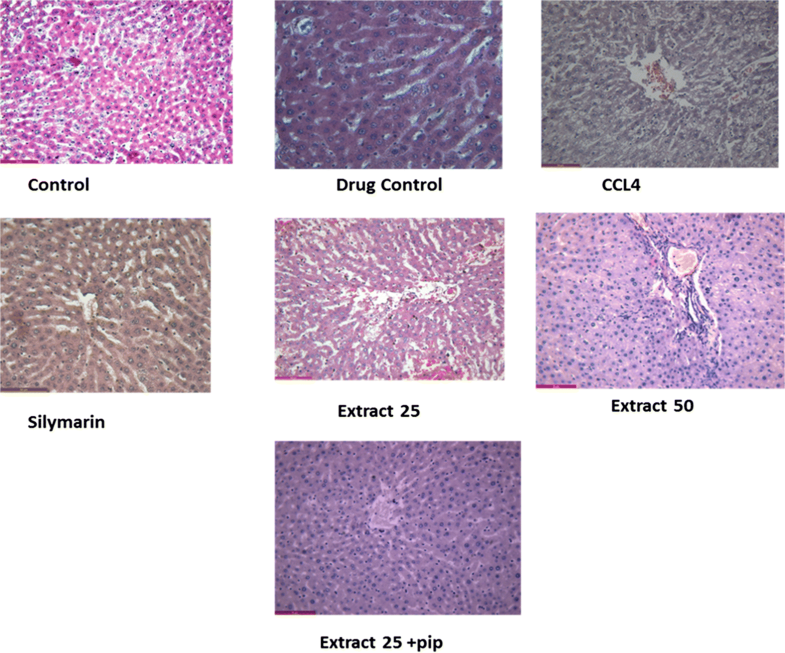 CCl4 is a well-known hepatotoxin and is widely used experimental model of hepatic injury. ALT, AST and ALP are the cellular enzymes, which increase during hepatic injury due to the impaired transport function of hepatocytes . High level of AST in the serum indicates cellular injury and disturbance in transport function of cell membrane in the liver . In the current study, we found that serum ALT, AST, ALP and LDH level increased after CCl4 administration, which indicates hepatocellular injury. 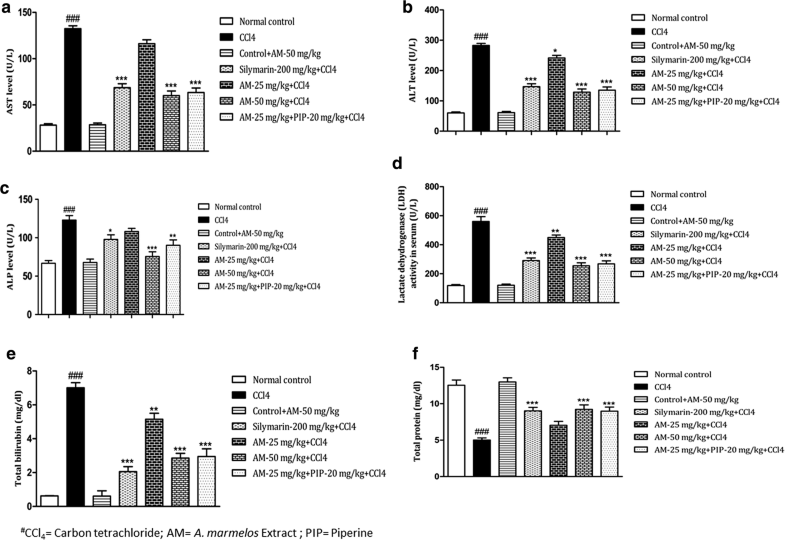 Pretreatment with A. marmelos and silymarin as well as combination with piperine dose dependently reduced elevated serum enzymes by maintaining integrity of hepatocellular membrane. Bilirubin is a product formed from the breakdown of red blood cells within the reticuloendothelial system. Elevated level of bilirubin indicates impaired bilirubin transport, increased hemolysis or decreased conjugation with glucuronic acid . Bilirubin is an indicator to assess the normal functioning of the liver . In our study, bilirubin level was found elevated in the CCl4 treated group, which indicates the abnormal functioning of the liver. However, high dose of A. marmelos extract and concomitant piperine and low dose of A. marmelos extract treatment significantly reduced the elevated level of bilirubin in CCl4 treated group. The above results indicate that A. marmelos extract treatment and combined treatment of A. marmelos extract with piperine exerts hepatoprotective effect against CCl4 induced liver toxicity. The results were also comparable with silymarin group. The damage of liver cell plasma membrane leads to release of, a variety of enzymes normally located in the cytosol into the blood stream. Their estimation in the serum is a useful quantitative marker of the extent and type of hepato cellular damage [53, 54]. In the present study, the hydro-alcoholic extract of leaves of A. marmelos showed a potential dose dependent in vivo hepatoprotective activity as it is evident by the elevation of the reduced levels of liver cytosolic SOD, catalase, and peroxidase activity. These antioxidant enzymes are involved in the reduction of reactive oxygen species (ROS) and peroxides produced in the living organism thereby playing a vital role in maintaining the redox balance. Results revealed that the hydro-alcoholic extract has a potential to help in cellular defense mechanisms by preventing cell membrane oxidation as indicated by the restoration of the SOD activity toward normal value . A. marmelos extract and silymarin can also play a vital role in scavenging hydrogen peroxide, as indicated by an increase in the catalase activity with respect to CCl4 treatment group. Similarly, an increase in the peroxidase activity indicates that the A. marmelos extract also helps in the restoration of vital molecules such as NAD, cytochrome, and glutathione . In the current study, we found elevated level of MDA content in the liver of CCl4 intoxicated rats, indicating the presence of CCl4 evoked oxidative stress. Previous studies have shown the free radical scavenging property of A. marmelos extract due to presence of high phenolic components in the A. marmelos extract [56, 57]. Our results demonstrate that pre-treatment with A. marmelos significantly reduced MDA content indicating a decrease of oxidative damage. Our findings are in parallel with previous reported studies, which indicated potent antioxidant potential of A. marmelos [45, 56, 57]. Further, the HPLC results of the extract revealed the presence of rutin in high amounts thereby supporting the hepatoprotective results. Inflammatory cells are recruited and activated due to direct oxidative stress, which can intensify liver damage by the release of several inflammatory mediators, including cytokines . TNF-α is a pleiotropic cytokine with numerous immunologic and metabolic actions. The TNF-α activity is increased in liver cirrhosis and generally thought to be associated with several known cirrhosis related complications such as hyperdynamic circulation, susceptibility to infection, and hepatic encephalopathy . Experimental data from animal models and clinical data from patients suggest that inflammation-associated cytokines including pro-inflammatory cytokines such as TNF-α and Transforming growth factor-β (TGF-β), and anti-inflammatory cytokines such as IL-10, are involved in the development of liver injury. The effects of IL-10 have been observed in viral or autoimmune hepatitis, alcoholic liver disease, and animal models . Our results demonstrate that the increased TNF-α level due to CCl4 induced liver injury were effectively reduced by the pretreatment with A. marmelos and silymarin. However, IL–10 levels were not reduced which indicated that the mechanism of hepatoprotection showed by A. marmelos was not through decreasing the levels of anti-inflammatory cytokines and it remains elusive. To ascertain the mechanism, further studies are warranted before we could conclude on the exact mechanism(s) involved in the hepatoprotective activity of the A. marmelos. The results of this study demonstrate that A. marmelos leaf extract possess hepatoprotective properties. These properties could be linked to the presence of phenolic compounds as confirmed by the phytochemical screening and to their antioxidant properties. Literature is also supportive of the fact that phenolic compounds possess hepatoprotective and antioxidant properties [61, 62]. In addition, rutin was the major phenolic compound available in this plant as was evident from HPLC study. Hence it could be postulated that the hepatoprotective potential of the A. marmelos leaves could be attributed to rutin. Moreover, A. marmelos extract significantly reduced the elevated TNF-α level thus indicating the possibility of reducing the pro-inflammatory cytokines. Further, the results of this work showed a comparable hepatoprotective effect of A. marmelos to that of silymarin. The hepatoprotective activity of A. marmelos leaves extract was augmented when piperine was co-administered. The augmentation of hepatoprotective effect was possibly due to the bio-enhancing properties of piperine or by the synergistic effect of phyto-constituents available in A. marmelos and piperine. All our experimental results revealed that A. marmelos leaves extract could be formulated in combination of piperine for enhanced liver protection against several liver toxicants such as CCl4. Therefore, the results of the present study are in accordance with the previously reported results revealing the hepatoprotective potential of the plant. Majority of the published literature provides evidence regarding the hepatoprotective potential of fruits of A. marmelos. Furthermore, the published studies reporting the hepatoprotective potential of leaves were on crude leaf powder and on very high doses without any reference to LD50 data for the plant extract [9, 39]. However the current study demonstrated the hepatoprotective potential of standardized A. marmelos leaves extract in a dose dependent manner utilizing the LD50 data reported. Moreover, our study provides evidence that the addition of piperine to the leaves extract of A. marmelos aids in achieving the desired hepatoprotection at lower doses. Additionally, the considerable amount of rutin might be responsible for the enhanced hepatoprotective activity of A. marmelos, however, the mechanism of action still needs to be studied. In summary, the results strongly indicated that A. marmelos and A. marmelos + piperine exhibited considerable hepatoprotection, which is comparable to that of silymarin. This study provides vital evidence about the hepatoprotective potential of A. marmelos prospecting this for developing potential hepatoprotective therapeutics. SS conceived of the presented idea, designed methods, provided critical feedback and helped shape the research, analysis and manuscript. DR performed the experiments, verified the analytical methods, interpreted the results and prepared the draft of the manuscript. AK was involved in the commencement of the proposal and revised the manuscript conclusively. All authors read and approved the final manuscript. The research facility provided by IKG Punjab Technical University, Kapurthala is gratefully acknowledged. The authors wishfully thank Dr. Sujata Bhattacharya for her help in authentication of the plant material. The authors declare that they have no competing interests and authors alone are responsible for the content and writing of the paper.